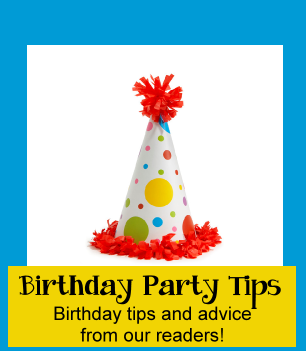 Great ideas and tips from Moms and party planners that will help make your next birthday party a success. These tips and planning ideas may seem basic, but they really work! I remember when my kids were younger I served the cake right after the kids arrived for the party - then had to deal with all the sugar craziness. But a friend told me to move the cake and ice cream to the end of the party and it made all the difference in the world. Such a simple thing, but it made all future parties run smoothly. Here are some other great tips from our readers. Send us your party saver tips so other Moms and party planners can benefit from your tips. Great tips to picking a bounce house or moonwalk for your next birthday party, how to choose the right company for price and safety. Serve the ice cream and cake (or any sweets) toward the end of the party. This way the kids won't be bouncing off the walls on a sugar high during the party. On the invitation plan ahead for sticky party situations such as uninvited younger siblings wanting to stay for the party, if you want parents to attend the party or how to handle asking parents to pay for themselves at an off site venue. See our RSVP and invitation help page for ideas on how to handle RSVP and crazy party situations. If you are having pizza ask the restaurant to cut the pizza into 10 or 12 slices instead of 8. A good rule of thumb is to invite as many guests as the age of your child. A piñata is always fun! Have the smallest kids go first and the sluggers at the end so everyone gets a turn to try and hit the piñata. Give the kids bags before they start to put candy in. Have a 10 second rule that the kids have to wait 10 seconds to grab candy after the piñata has been opened. Get a phone number on where you can reach parents as the kids are coming in. This way if there is an accident or you need to send one of them home you have a correct number. 2 hours is usually enough time for a party for a grade school child. Elimination games don't work as well for younger children - if you play them make sure you have something to do for the ones who are "out". Write out a schedule for the party in 15 minute segments. Lisa P.
Instead of paper cups (which always get spilled anyway) get bottled drinks with sports tops on (less likely to get spilled) and put each child's name on a sticker on each one. No confusion - less waste. See our pages of fun birthday party games! Make sure your child is including all the guests in the party activities and games.